People often have an inherent fear of wasps. They are large, conspicuous buzzing insects with yellow and black striped, wasp-waisted bodies, 10-15mm long. They have a sweet tooth at one end and a painful sting at the other. The larger queen wasp hibernates over winter, and then makes a wasps nest in the spring in which to lay her eggs. She feeds her young on insects until they grow into the worker wasps, around three to four weeks later. Workers, all sterile females, forage for over a mile in search of food. 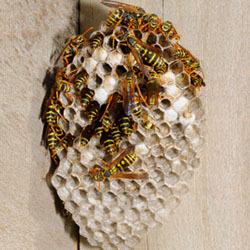 A single nest can produce 30,000 wasps in a year. In August-September, wasps are particularly renowned for becoming a nuisance as the workers become more complacent in their surroundings. If you find a wasps nest in a wall or bank it needs to be thoroughly sprayed with insecticide. This can be hazardous and is best performed by a Pestforce professional wasp control technician. Commercial premises can be protected by insect screening of windows along with the installation of electrical devices which attract, kill and catch wasps. For your free onsite wasp pest control quotation, search for your local Pestforce technician at the top right corner of this page.